As Health and Safety requirements become ever more exacting and the price of failure ever more costly, both in human terms and the associated financial implications, it is vital to adopt and exert maximum advantage from the enormous strides towards standardisation that have taken place throughout the world in recent years (see foot note). That standardisation has tended to give a much firmer sense of direction and has brought with it more consistent levels of protection for workers at height. With many of the basic problems of providing safe work at height still awaiting the necessary motivation from industry to address them, there is very little doubt remaining that the solutions are now in place for those prepared to take the appropriate steps. It is to be expected that some industry sectors will consistently flag up previously unknown problems to overcome, but the fact that these can be readily identified is progress in itself. Foot note: In Europe Personal Protective Equipment (PPE) is covered by the PPE Directive 89/686/EEC. This directive lays out the procedures for the certification of items of PPE to the relevant EN standards, e.g. Full Body Harnesses are certified under EN361. Standards also exist for certain but not all types of rescue equipment and, as such, they are not comprehensive. 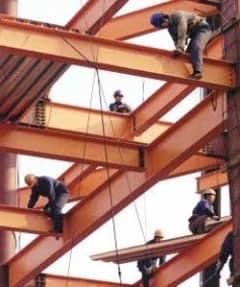 Although we live in an age where the issue of fall protection for workers in industry is well documented, the issue of rescue is comparatively less so. The solutions are however still available, but standards in Europe certainly are not as clear as they could be, so users lack the direction they require. Rescue and Evacuation by a third party. This article will deal with the first topic. One of the most frequently overlooked problems/factors that I come across when companies are assessing the risk associated with a task is the provision of rescue for those injured or suspended at height. In far too many cases risk assessment has not progressed to the point at which this has been properly taken into account, but has simply concentrated on the immediate and more obvious hazard of the fall itself. Not all companies treat Safety at Height as integral to their operation, or as a major concern, unless the tasks are perceived to be more extreme. Are we led by what we perceive to be hazardous, exposed or high risk situations and do we address matters on this basis, rather than by using methodical risk assessment? The more spectacular projects generally relate to only a small core of workers. Typically these will be better trained, more professional in their approach to Work at Height and more likely to address all the issues. If companies are to fulfil their obligation to provide safer working conditions for workers at height, it becomes imperative to ensure that all related aspects, from the approach through to their safe return, are included in the risk assessment programme. At each stage of assessment there will be a hierarchy of measures or approaches, but it must nevertheless be clear that all stages are thoroughly questioned and addressed. A common factor in risk assessment is that it would appear that in some areas we are led by our instincts rather than actual concerns and, whilst we go through the motions of a risk assessment process, we summarily dismiss or emphasise certain issues with little or no application of reason. A case for showing the existence of double standards in certain areas of height safety thinking would be the situation in which it becomes necessary to access a confined space, such as a vessel or silo, down a vertical ladder. In such a scenario there should automatically be fall protection provision, normally in the form of a fall arrest block. This provision should also include the capability to retrieve the worker in the event of problems arising, and indeed it is rarely overlooked. The same worker may also elect to use a fall arrest block for security when climbing and accessing the ladder on the outside of the same vessel or silo, but in this case the provision of rescue or retrieval is rarely addressed. It is not difficult to find further examples of this, some too awful or negligent to be mentioned here. For instance, whilst we may see proper precautions put in place for the well-being of a worker exposed to a fall of a 100 metres, it's all too common to find that workers at, say 2-4 meters, have received no consideration as to their safety at all. In many cases the risks to the worker at 2-4 meters may actually be higher due to the complacency caused in an "apparently" safe situation. It is a well known fact that a sense of exposure helps to sharpen most people's awareness. We need to remind ourselves that a best practice regime is always one in which reasonably predictable circumstances, no matter how extreme, have been fully reviewed and all concerned are aware of the potential seriousness of the situation. Whilst the examples cited may well be subject to a number of plausible explanations, it is instructive to look at some industries that take these vital precautions seriously and compare them with others that are apparently oblivious to the presence of danger. Teams are composed of a mix of staff - from supervisors to operatives - providing the required level of expertise for a given task, yet remaining cost effective. Planning processes intended to secure the rescue of personnel are central to the techniques involved. I certainly have no wish to single out the construction industry or to imply that it differs greatly from any one of a number of other industries in addressing the safety needs of its members. In fact, construction is a complex area where, although there is room for improvement, considerable progress is being made in a sector that is always likely to be problematic due to constantly changing parameters. What is clear is how a small number of sectors address the issues to a very high degree whilst the majority virtually ignore it unless it is a specifically extreme task. And so when all of the above factors are pulled together for analysis, it is not difficult to recognise that the question of a satisfactory level of planning for the rescue and evacuation of a suspended or injured worker is quite often not on the agenda. The case for all workers to receive equal levels of cover regardless of how sensational or mundane their task, needs to be highlighted to avoid an unhealthy over-reliance on the potential role of the emergency services. Just how often are our legitimate concerns too easily allayed by the thought that we can take for granted the fact that the emergency services can successfully step into any predicament that we can create with no need for prior consultation or ongoing discussions. Can they actually satisfy our requirements, and do we help them to understand our expectations? The Health and Safety Executive and major contractors may well consider that there is nothing inherently wrong in relying upon the emergency services to be both willing and able to offer cover to a given site for the purpose of rescue at height. What would be distinctly incorrect however, and bearing potentially disastrous consequences, is the arrogant surmise that they are there essentially to provide cover without prior consultation. Worse still, as projects progress and the parameters (access to site, obstacles, increases in height and difficulty) change, no reappraisal or renewed consultation occurs to ensure that they can still satisfy requirements. The time scale within which any rescue and evacuation at height is carried out is almost certain to be one of the major considerations. 15 - 20 minutes in suspension is normally the maximum time it is recommended that a fallen worker can safely withstand before serious physical problems can begin to occur. The time scales and problems associated with suspension trauma are difficult to quantify accurately, but an excellent source of information is HSE Report CRR 45/2002. It can be seen, then, that over reliance on an external source introduces a situation where there is no margin for error such as delays in traffic congested areas. The level of cover is a major consideration, never more so than when the emergency services are required to be elsewhere at the time your crisis occurs. Needless to say, if we all rely exclusively on them the service will soon become overstretched, with much less chance of the critical time scales being met. As your project progresses, the environment in which the emergency services would be expected to operate will be constantly changing. It is clear that their rescue and evacuation efforts will be much less effective if planning and consultation has not taken place at strategic points during the life of the project. With this in mind it is vital that each party fully understands the other's concerns, in order to continuously review and update the situation before those issues become critical. Having said all of that, if the appropriate concerns are adequately addressed then the emergency services can provide excellent professional service. A Dual Role in Rescue and Evacuation? The advantage to be gained by using a professional rescue and evacuation service is chiefly that, provided the initial assessment and ongoing consultations have been carried out correctly, then there is no reason why it should not be cost effective, efficient and reliable. Needless to say, the likelihood that such a scheme could be rendered dangerously unsatisfactory without appropriate consultations and considerations may be very high indeed. In addition it may also be wise to set in place provisions as a first line of defence so that at least the job can be started without waiting for assistance from an external source. The worst scenario would be that the rescue is completed before assistance arrives. This helps to address the critical time scale involved for safe rescue and evacuation. The two different levels of approach outlined can also be defined more clearly if we categorise the rescue provided and identify what we can reasonably expect of them. This will allow us to see if one provider alone is sufficient or if two are thought to be necessary and how they will interact if required. As mentioned at the beginning of this article, we would then instinctively go on to distinguish between Rescue/Evacuation by a third party or Self Rescue/Evacuation, a distinction which can be difficult to define and which, logically, will require editorial treatment as a subject in its own right. As we have seen during the course of this article, some industries are capable of identifying, sourcing, operating and controlling sophisticated levels of rescue preparation and cover. Others have barely scratched the surface in what is becoming an increasingly well documented area of concern for workers at height. For those who have yet to address the issue fully it may be worth looking at additional fringe benefits which could act as added incentives to move ahead. This may mean that only the bare minimum is provided as a first step, but at least it's a start. Also if the move is to provide basic in-house cover then achieving this minimum requirement will enable the emergency services to assist and/or take over during the incident. Should the anticipated back-up not materialise, you will also be in a much stronger position to resolve the situation than would otherwise have been the case. There may also be further, frequently forgotten benefits arising from this course of action. Chief amongst these could be an unexpectedly positive response from insurance companies in situations where they are able to distinguish between an organisation with a firmly identifiable policy for the rescue of workers at height and one simply offering the bare minimum of cover. Health & Safety Executive (HSE) www.hsebooks.co.uk in Contract Research Report 451/2002 'Harness Suspension: Review and Evaluation of Existing Information.